Apricot (Prunus armeniaca ) is an important fruit crop of midhill and dry temperate regions of India. Cultivated apricot has its origin in North-Eastern China, whereas wild apricot, popularly known as zardalu, appears to be indigenous to India. It grows wild in hills of Shimla and Kinnaur districts of Himachal Pradesh. Fruit is delicious. It is rich in vitamin A and contains more carbohydrates, proteins, phosphorous and niacin than many other common fruits. Besides its use as dessert, it is also canned and dried. Fruit is processed into jam, nectar and squash. The kernels are either sweet or bitter, dep[ending upon the variety. The sweet kernels are used as a cheap substitute for almonds in pastries and confectionery. The bitter kernels are used for oil extraction. In India, apricot is grown commercially in the hills of Himachal Pradesh, Jammu and Kashmir, Uttar Pradesh and to a limited extent in north eastern hills. Some drying type apricots are being grown in the dry temperate areas of Kinnaur and Lahaul Spiti in Himachal Pradesh and Ladakh in Jammu and Kashmir. Apricot can be successfully grown at an altitude between 900 and 2,000m above mean sea level. White-fleshed, sweet kernelled apricots require cooler climate and are grown in dry temperate region up to 3,000 m above mean sea level, whereas yellow fleshed, bitter-kernelled ones thrive better under the warmer climate of mid hills (900-1,500 m) the long cool winter (300-900 chilling hours below 7`C), and frost free and warm spring are favourable for fruiting. Average summer temperature (16.6`-32.2`C) is suitable for better growth and quality fruit production. The sites located in north eastern India at lower elevations and on South- Western at higher elevations are suitable for its cultivation. Spring frost causes extensive damage to the blossoms which are killed when temperature falls below 4`C. apricots thrive better under low humidity as high humid conditions in summer increase the incidence of brown rot. An annual rainfall of about 100 cm well distributed throughout the season is good fruits normal growth and fruiting. Being hardy, it can grow in most of the soils, but deep fertile and well drained loamy soils are more suitable for its growth and development. The pH of the soil should be 6.0 -6.8. However, in Ladakh and Kinnaur, large wild apricots grow in sandy, well drained and less fertile soils. In India, apricot is grown in midhills to high hills having variable climatic condition. Varieties which are suitable for midhills are not suitable for high hills or dry temperature region. About 100 varieties of cultivated apricot are available in India. Most of them are of exotic origin. The promising varieties recommended for different regions are given in Table 1. Apricots are commercially propagated by grafting or budding. Multiplying through cuttings is rarely done. 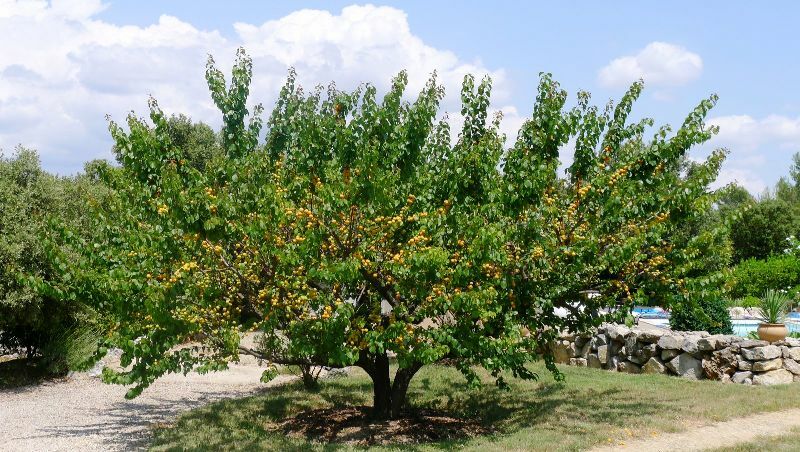 Wild apricot (Chuli) and wild peach seedlings are generally used as a rootstock. The graft union on wild apricot is good and the trees are more vigorous than on plum and wild peach. Peach is a satisfactory rootstock for light soils and dry conditions but sometimes the graft union is enlarged or rough. Under heavy soils and excessive soil moisture conditions, apricot on Myrobalan plum grows better. For raising the footstock, seeds are collected from fully ripe fruits of wild apricots. Apricots seeds require stratification for a period of 45-50 days at 4`C to break dormancy. The germination of seeds can also be hastened by soaking the seeds for 24 hours in 500 ppm GA3 or 5ppm Kinetin solution before sowing. The stratified seeds are sown 6-10 cm deep in well prepared nursery beds at a distance of 15-20 cm from seed to seed in rows 25-30 cm apart. After sowing, the beds are mulched with 6-10 cm thick grass and light irrigation is applied. The seedlings attain graftable size one year after sowing. Tongue grafting, T-budding and chip budding are generally adopted for its multiplication. The seedlings of pencil thickness are grafted with tongue method in February, while the seedlings also give very good success. After one month of bud take, the tying material (polythene) should be removed. Aftercare of grafted plants like single stemming, staking, weeding, watering and plant-protection measures should be adopted at regular intervals. Application of farmyard manure @80 tons/ha and 30 kg/ ha of P2 O5 is recommended for better growth of grafted/ budded plants. Apricot is planted during the dormant season. (December-end to mid-March), but early planting gives better establishment of plants. Pits of 1m x 1m x 1m size are dug about a month before planting. They are filled with a mixture of soil and 50-60 kg well decomposed farmyard manure. About 1 kg single super phosphate and 10 ml Chorapyripos solution (10ml /10 liters of water) is also added to each pit. On flat land, a regular layout system such as square and triangular is followed, while on the hill slopes, contour system is generally practiced. The spacing of plants varies with the soil, climate and vigour of cultivar. The plants are generally planted at a distance of 6m x 6m. Due to the absence of the dwarfing rootstock, high density planting is still to be standardized with proper training and pruning system, and with the use of growth retardants. One year old, healthy and disease-free plants are planted in the middle of the pit. The soil is pressed gently to that roots are set. Watering should be done immediately to establish close contact between roots and soil. After planting, tree basin is mulched with 10 cm thick hay mulch to conserve soil moisture. In summer, watering should be done as and when required. Apricot is trained to open vase and modified centre leader system of training, though the open vase system of training is more popular in the hilly regions. At the time of planting, one year old whip is headed back at about 60-70 cm above the ground and 3-5 well spaced shoots are allowed to grow in all directions. Pruning is more important in first dormant season because the framework developed in this period gives ultimate shape to the tree. In first dormant season, 3-5 primary scaffold branches arising at proper angles (45`), well spaced (10- 15 cm apart) and spirally arranged around the tree trunk are selected. The lowest branch should be 40-45 cm above the ground level. All the primary scaffold branches are headed back to half of their growth to get the secondary branches on them. During second dormant pruning, 5-7 well spaced secondary scaffold branches are selected on each primary branch and other are removed. At the end of third year, pruning is confined to the thinning of branches which are either over crowding or crossing each other, for proper development of the framework and to admit adequate sunlight in the tree canopy. Apricot bears on spurs and laterally on one year old shoots. The spurs have a short life of 3-4 years. Many of them are also broken during fruit plucking. The production of young growth is, therefore, essential for the initiation of new spurs which generally takes place at the bases of the growing laterals. In young bearing trees, pruning should be light and of corrective type but in older trees, heavy pruning should be done to maintain balance between growth and fruiting. In apricot, 25-30% thinning of one year old shoots or one third heading back is recommended to improve fruit size and quality. After pruning Chaubattia paste is applied on the cut ends of the shoots. Apricots remove a large quantity of nutrients from the soil, requiring replenishment with both organic manures and chemical fertilizers. The manorial requirement depends upon age of tree, type of soil, climatic conditions and cultural practices, which vary from region to region. For mature trees (7 years old or more) a mixture of 40 kg farmyard manure, 500gN, 250 g P2 O5 and 200 g K is recommended. The farmyard manure should be applied during December-January along with full dose of P and K. Nitrogen is applied in 2 doses: first half 2-3 weeks before flowering and the remaining half a month later, if irrigation facilities are available. Under rainfed conditions, the second half dose of N should be applied at the onset of monsoon or through 1 or 2 foliar sprays of urea (0.5%) after fruit set. Fertilizer should be broadcast on the soil surface under the spread of the trees and mixed with steep slopes; the band application of nitrogenous fertilizers should be preferred over broadcasting. In apricot orchards application of Atrazine or Diuron@ 4.0 kg/ha as pre-emer-gence and Gramaxone @2 liters/ ha or Glyphosate @800 ml /ha as post emergence is quite effective and economical to control weeds. Mulching tree basins with 10-15 cm thick dry grass also checks weed growth. During the initial 2-4 years, pea, bean, soybean, and cowpea enrich the soil and give economic returns also. Fruit set in apricot is rather heavy which results in under sized fruits, increasing the tendency of biennial bearing. Fruit thinning improves fruit size, promotes regular bearing, decreases limb breakage (due to heavy crop load) and maintains the tree vigour. Fruit thinning should be done within 40 days after full bloom (last week of April or first week of May). Both hand and chemical thinning methods are employed. Depending upon the crop load, the fruit may be thinned till the fruits are 6- 10cm apart. A spur should not have more then 2 fruits. Foliar spraying of 25-50 ppm NNA 20 days after fruit set is ideal for thinning. Though apricot is tolerant to dry atmosphere, it requires irrigation especially during critical periods of fruits growth and development. Water requirement varies with soil, tree age, climatic conditions and irrigation methods. The peak water use period is from April end to mid June, which coincides with fruit development period. Irrigation at 20 % depletion of soil moisture from field capacity improves fruit size and yield. It should be irrigated at 10 days intervals during May and 6-8days during June. In Himachal Pradesh, 8 irrigations in a season are sufficient for better size and quality fruits. Hay mulch (10-15cm thick) and black plastic mulch also help conserve soil moisture. 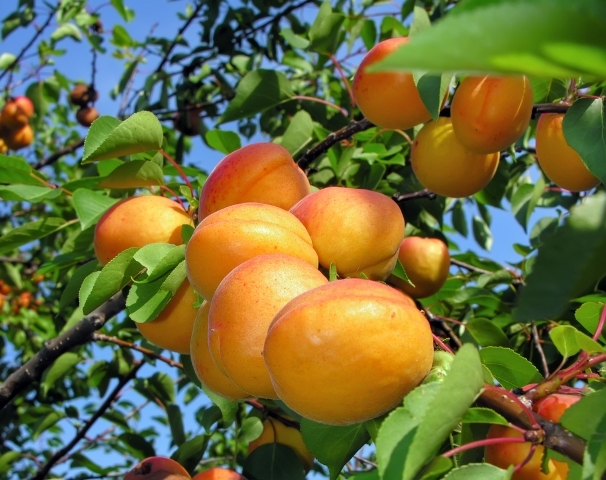 Apricot fruits generally mature during first week of May- June end depending upon variety and location. They are harvested manually and no mechanical harvesting is practiced. Change of surface color, days from full bloom to harvesting and fruit TSS are considered as the best indices of maturity. For fresh marketing, fruits should be plucked when they change their surface color from green to yellow. Fully ripe fruits are harvested for freezing, canning, and drying. In Himachal Pradesh, days from full bloom to harvest and fruit TSS have been standardized to judge the optimum harvesting time for different varieties. Since apricots are very perishable, due care is required during harvesting, packing and transportation. The fruits should be harvested in morning hours and direct exposure of fruits to sun should be avoided during grading and packing. Apricot trees start fruiting at the age of 5 years and continue up to 30-35 years. They attain full bearing age at about 7-10 years, yielding 50-80 kg/tree or 15-22 tons/ha. Before packing, fruits are graded according to their size. Fruits are packed in wooden boxes or CFB cartons. Each box is lined inside with newspaper sheets keeping the margins for overhanging the flaps. The boxes are initially padded with pine needles at the bottom to avoid the bruising of fruits. Wrapping of individual fruits is not done in apricot. Fruits are arranged in layers and top layer is covered with paper by bringing together overhanging flaps. Then top of the box is nailed. Small sized CFB cartons are also used for packing apricots. The CFB cartons are lighter in weight, easy to handle and in packing. The fruits fetch better price because of lesser bruising damage. However, they are slightly more expensive than wooden boxes and need protection from direct rains. Although apricots are perishable they can be stored at 0`C for 1-2 weeks with 85-95 % relative humidity. Due to the perishable nature and very short storage life of fruits, apricots are marketed in the local markets and nearby cities. Generally, the growers sell their produce by auction to the contractors. They send the fruits to Delhi and nearby markets. Some big farmers send their produce directly to the markets and sell through the commission agents.